A copy of the first edition in book form of the Emancipation Proclamation, the document that freed the slaves in the Southern states during the American Civil War, will be offered by Heritage Auctions in its Americana and Political Signature sale May 24, 2014. It is estimated to sell for $5,000-$7,000. The Proclamation in its preliminary form was issued by President Lincoln on September 22, 1862. It stressed military necessity as the basis for the freeing the slaves. 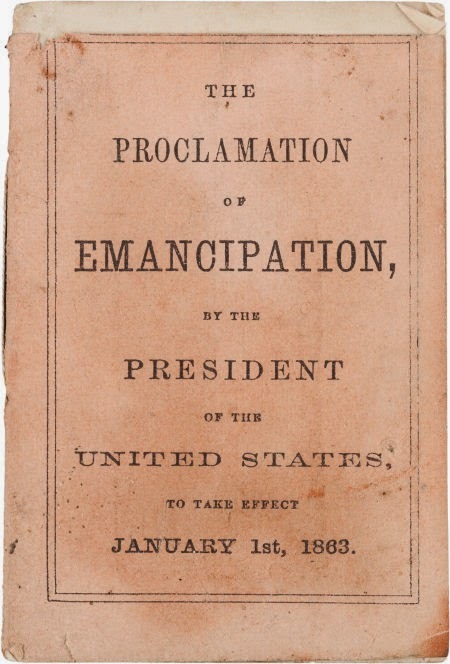 The revised and final Proclamation became official on January 1, 1863. It was published as a broadside and simultaneously as a seven-page booklet (3 1/8 x 2 1/8 in.) in pink wrappers in December 1862 by John Murray Forbes, a Boston Unionist who helped to raise troops, including the famous 54th Massachusetts Regiment. The booklet, seen above, was intended for distribution to Union troops who, in turn, could distribute copies to slaves in regions of the South occupied by Union forces. It has the original thread binding and a brass grommet through pages 5-7 and the back cover. It is estimated that less than ten copies have survived. Collectors of celebrity and historical hair will have their own stand on end and dance a jig in their follicles when Heritage offers five strands of Abraham Lincoln's scalp hair, part of a lock clipped while The Great Emancipator was on his deathbed. The hairs are estimated to sell for $1,000-$1,500. The lock was originally owned by Dr. Charles Sabin Taft who was the second surgeon to treat Lincoln on the evening of his assassination. The five hairs are part of the most authenticated lock of Lincoln's hair extant. It was originally removed by Dr. Charles Leale, the first surgeon to arrive in aid of the dying President, so he could have clear access to examine and treat Lincoln's wound. The lock was given to Mrs. Lincoln who soon returned it to Dr. Taft as a gift in appreciation of his efforts. Taft was a young surgeon who attended wounded Union troops at a Washington hospital and had become acquainted with the President during Lincoln's visits to the recovering soldiers. Dr. Taft willed the hair to his son, Charles C. Taft, who sold it to William H. Lambert in 1908. Upon Lambert's death, the Lincoln hair was sold to Henry C. Hines, in whose possession it remained until 1993 when it was discovered in his estate. 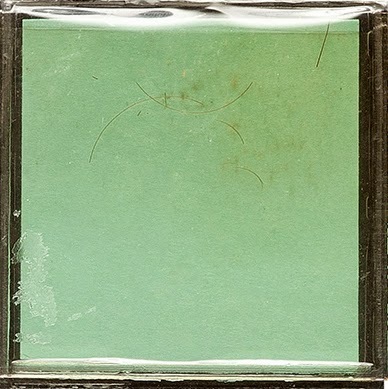 The small hairs are preserved in a plastic sleeve and barely perceptible in the image above. Copies of dozens of letters, documents and articles accompany the strands of hair as well as a Certificate of Authenticity from John Reznikoff of University Archives, holder of the Guinness World Record for the largest and most valuable collection of celebrity hair. A dubious distinction to the artifact-jaded, perhaps but I, for one, think DNA testing on literary celebrities' hair could be quite revealing; I'd like to get a load o' Georges Sand's genome, for historical purposes only, of course. 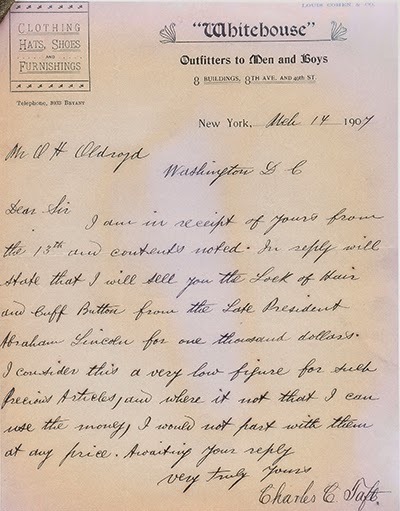 Included is a letter from Charles C. Taft to Civil War sergeant, writer, and famed collector of Lincoln memorabilia, Osborn H. I. Oldroyd (1842-1930), offering the lock of hair in 1907. I am in receipt of yours from the 13th and contents noted. in reply will state that I will sell you the Lock of Hair and cuff button from the late President Abraham Lincoln for one thousand dollars. I consider this a very low figure for such precious articles, and were it not that I can use the money, I would not part with them at any price. Awaiting your reply. It is unknown how many strands of hair were in the original lock. Charles C. Taft split hairs, presenting six strands to John Hay, Lincoln's personal assistant and, later, Secretary of State. Hay had his six strands put inside a ring and in 1905 presented them to President Theodore Roosevelt upon the occasion of his inauguration with a letter that read "The hair in this ring is from the head of Abraham Lincoln. Dr. Taft cut it off the night of his assassination." The rest of the lock remained in Taft's possession. His offer to Oldroyd declined, in 1908 Taft wrote to General James Grant Wilson offering the Lincoln Hair and a cuff button for sale. Wilson couldn't purchase the items but he alerted Major William H. Lambert. Lambert purchased the Lincoln items in a well documented sale on March 12, 1908. For collectors of Americana, particularly of Lincolniana, these five strands of Lincoln's hair should be tantamount to five leaves from a Gutenberg Bible yet they are being offered for only $200-$300 per strand. For perspective, a lock of Elvis Presley's hair sold in 2009 for $15,000. Our cultural priorities appear to be twisted; sic semper tyrannis, Jack. Perhaps if Lincoln had sung Heartbreak Hotel while wearing blue suede shoes on the night of the assassination his hair would be appraised at higher price. Not too long ago twelve strands of Michael Jackson's hair sold for $2,000, a price that seems rather low but the hairs were singed in 1984 while Jackson was shooting a Pepsi commercial and his head accidentally caught fire during the pyrotechnical display: condition is everything. Michael Jackson hair in fine condition would surely have been a thriller and fetched a great deal more. Hair today, gone tomorrow, the auctioneer declared then ducked a tomato thrown his way. Images courtesy of Heritage Auctions, with our thanks.